Interview with Mr Mahmoud Moghaddam PhD, Managing Director and Chairman of Moshanir Power Engineering Consultants. Events- When was Moshanir first established? Moghaddam- Well, the history of the Company goes back to the early 70s, back to 1971 to be exact. Up till then the technical and engineering services of the newly created Ministry of Water and Power was performed in the various technical offices of the Ministry. Then, considering that the work of a ministry is administrative, a company was set up under the title of Water & Electricity Services Co, Mahab in short, based on the Persian words "mohandesi" meaning engineering, "ãab" meaning water and "bargh" meaning electricity. In 1980 the Company was divided into two, one company dealing with electricity and the other with water. Our Company adopted the name Moshanir based on the Persian words for engineering, consultancy, and power. Mahab was the other company that specialized in water. The latter company felt bogged down with rules and regulations governing public companies and so 51% of its shares were transferred to non-government entities in 1983-84. But our company continued as a government or public entity. E- Don't you have the same idea in mind? Are you not finding difficulties because of the same limitations? M- Yes we do have difficulties because of these limitations but at the same time these limitations force us to be better organized, particularly as regards our accounts and financial statements. They also make us to be more creative in order to be successful despite these limitations. All the same there are proposals to transfer 51% of our shares to the Social Security Organization which is a non-government entity but as yet no definite decision has been taken. As I was saying, Moshanir continued as a public entity after the Islamic Revolution. I should here point out that before the Revolution and in the early years thereafter the Ministry had 20 or so foreign consultants in the field of electricity, all of which were in fact large companies. It also had about the same number of consultants for water. But after the Revolution we had to stand on our own feet in the main part, because about 90% of the foreign consultants left their works unfinished and went back to their homes. At that time our peak of electricity consumption was about 7000 megawatts. At that time, all the consultation work for electricity units, even at the voltage levels of 63 kv was carried out by foreign firms. In their absence, our experts were given the opportunity to prove themselves. As a result, today, we provide more than 38000 megawatts of installed power supply with 85-100 dams, completed or almost completed and we have a very limited number of foreign consultants working here now. In technical and engineering matters where a high level of expertise is required the main decision-makers are Iranian experts. We do use some of the services of foreign consultants but the final decisions are made by Iranians. Also, about 98% of the facilities required for the production and distribution of electricity are manufactured in Iran by Iranian manufacturers. 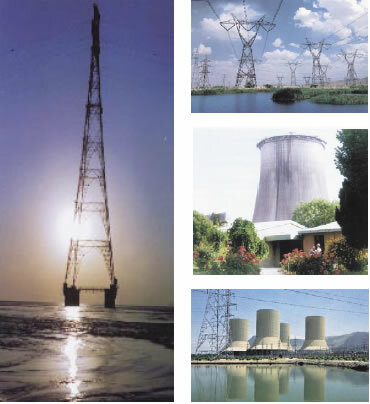 In case of thermal as well as hydro-electric power plants, 50 to 70% of our facilities are made in Iran. And I am proud to say that Moshanir has played an important role in this development and in the progress made. E- How many employees do you have today? M- We have about 1500 employees, holding secondary school diplomas or higher. Most hold bachelor's or higher degrees. To be exact 50 members of our staff are engaged in administrative work. About 150 are assistant engineers, and the rest are engineers holding bachelor's, master's or decorate degrees. Such experts are great assets to the country, by far more valuable than our oil resources. Today we offer services in thermal, hydro, and wind power generation. E- Have you done any work for other countries? M- Yes indeed; we have provided our services for setting up high power transmission lines in Turkmenistan, Turkey, Iraq, Azerbaijan, and Afghanistan. We also had some cooperation with Syria in transfer of technology. The Syrians asked us to send 10 experts to their country. We did so. Naturally, as in any other country, our experts were initially looked at as strangers but soon the Syrians realized that we had a lot in common with them, the same religion, similar culture etc. And they found that our experts were truly and seriously trying to teach them. So, they requested that our experts stay for a longer period and that we establish a joint venture company in Syria similar to Moshanir. But because of some of the limitations discussed earlier, this is still under consideration even though the Articles of Association of the JV have been drawn up. We are constantly under pressure from the Syrians. Other projects abroad include the transmission lines from Iran to Armenia, and Iran to Azerbaijan, and from there to Georgia and to Russia. It is interesting to note that despite the close connections between these countries with Russia, and despite Russia's capabilities in engineering works, these newly independent states prefer that we do the job. In Afghanistan we provided our services for a transmission line from Khorassan Province in Iran to Harat. The Afghans have asked us to set up an office in Kabul. We have some political difficulties, but it is being arranged and the office will soon be opened. We are also having discussions with the Iraqis about certain projects. No actual work has yet started, but we are sure of being given some projects of considerable size soon. So, in general our future looks quite promising.